This is another two-in-one recipe. After making the stuffed tomatoes I didn't want to throw out the flesh and seeds that I had scooped out. My super-smart husband suggested making a salad dressing out of it. And it's delicious! I have also been using it as a dip for bread. It's so good you can even eat it on it's own like gazpacho. 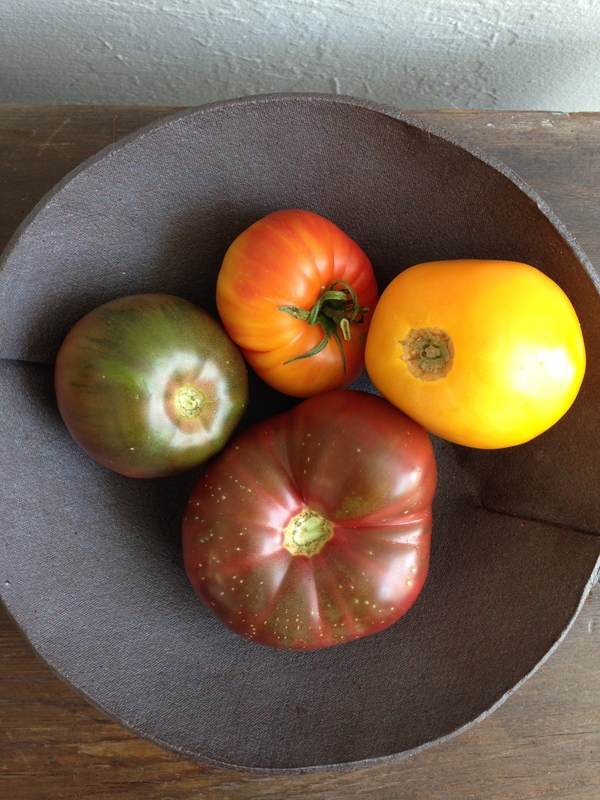 The most important part of this whole endeavor is finding great heirloom tomatoes. This dish just wouldn't turn out as well if you didn't use beautiful, ripe tomatoes, in season. 2. In a bowl, combine panko, salt, Parmesan, and parsley. Set aside. 3. Cut tomatoes in half around the middle (not through the stem end). Using a spoon, gently scoop out the seeds and flesh from the inside of each half and place in a bowl to use later for the vinaigrette. 4. Place tomatoes cut-side up in a baking dish. If some of them will not sit flat, slice a small bit off the bottom so they have a flat part and sit upright. Using a spoon or your fingers, add the panko mixture to each tomato, but do not press it down. The filling should be a bit rounded on top. 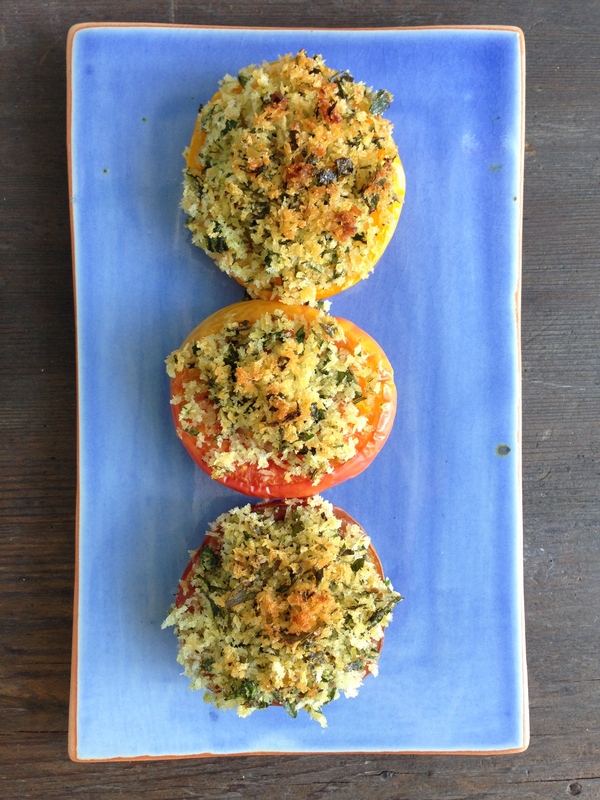 You may have some panko leftover, depending upon the size of your tomatoes. It will keep in the fridge for about a week. 5. Bake tomatoes for about 30 minutes or until the tops turn golden brown. You may have to rotate the dish halfway through the cooking time to assure even browning. 1. Take the bowl with the tomato flesh and juice and use your fingers to separate the seeds from the large pieces. Add those large pieces to a blender. 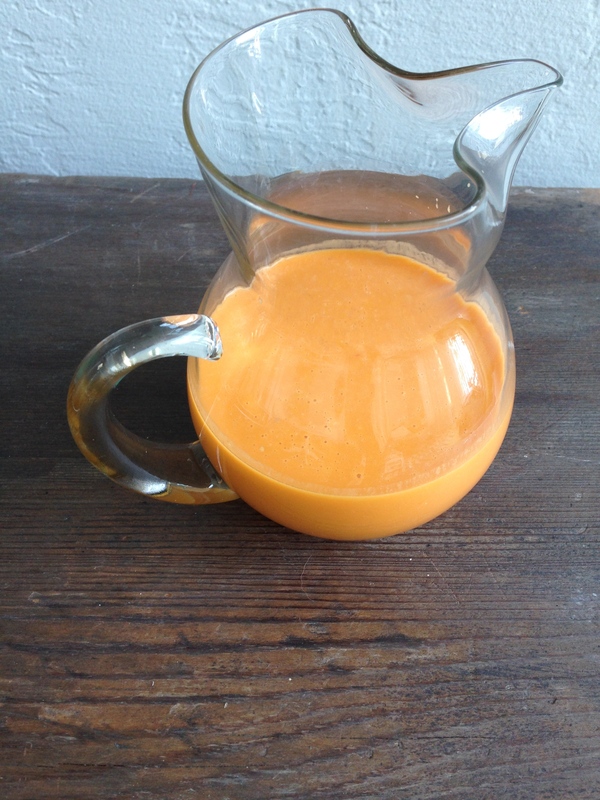 Pour the remaining juice containing the seeds through a fine-meshed sieve placed over the blender. You should have about 1/2 cup liquid and 1 cup tomato solids.